Louise Phillips Writer: A Reading Hit in Cork! A Reading Hit in Cork! 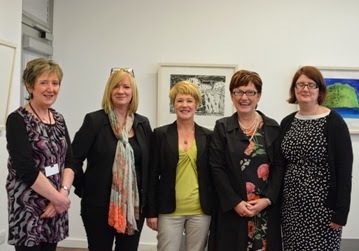 "Pictured at the very successful Readers' Day in Library Head Quarters in Cork -L-R Bernie Wallace, Cork County Library, crime writer Louise Phillips, novelist Roisin Meaney, Frances Tracey of O'Mahony's Booksellers who sponsored the event and Christina O'Sullivan, Cork County Library." I had such a great time at the Readers' Day in Cork last Friday. A fantastic crowd with lots of wonderful questions and an opportunity to meet so many lovely people, including fellow writer Roisin Meaney. Apparently RED RIBBONS and THE DOLL'S HOUSE are a great hit within the libraries in the region, being constantly out on loan!! In fact if it hadn't been for getting stuck in traffic for hours on Friday night in Dublin due to the One Direction concert, it would have been pretty much a perfect day!! A Day for Book Lovers! LARGE PRINT EDITION OF THE DOLL'S HOUSE! Bord Gáis Energy - Are giving away 4 libraries!!! Words can make your day! !